There's a common sense idea that cities are the opposite of nature. 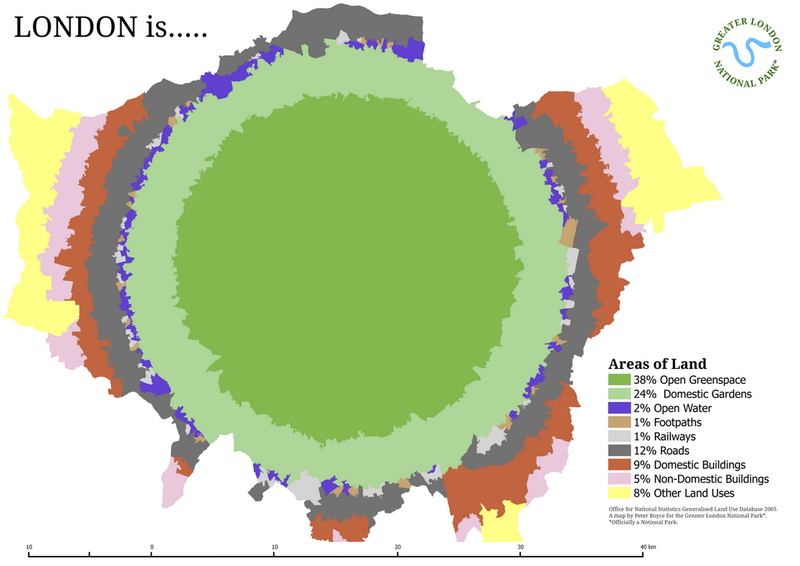 And yet if you look at this visualization of green space and gardens in London, what you'll find is that this giant metropolis contains more plants and wildlife than buildings. The Greater London National Park would be a new kind park, a 'National Park City' that would aim to conserve London's awesome ability to be dynamic, innovate and evolve. The Park's leadership role would be to inform and inspire best practice, help better to co-ordinate and promote London's biodiversity and recreational opportunities. A Greater London National Park is an idea that thousands of us could get behind to improve our communities, wildlife and habitats. Unfortunately London's mayor says it's not within his power to turn London into a national park, though he thinks it's a lovely idea.